If there’s one thing business people can agree on, it’s that things have changed. Over the last decade, the pace of change across businesses has been dizzying. While some B2B companies are lagging when it comes to adopting new trends, even the most established organizations realize that buyers don’t buy the way they used to. You know the challenges: buyers don’t want to talk to sales reps, an overabundance of channels in which to consume information, and so much noise that anything you put out gets lost in the crowd. But these challenges bring opportunities for B2Bs as well. There are a number of ways to get your messages out at low costs. Digital mediums, when designed and executed well, allow you to look bigger and punch above your weight class. Marketing technology has gotten more affordable, allowing even the smallest businesses to compete with behemoths. 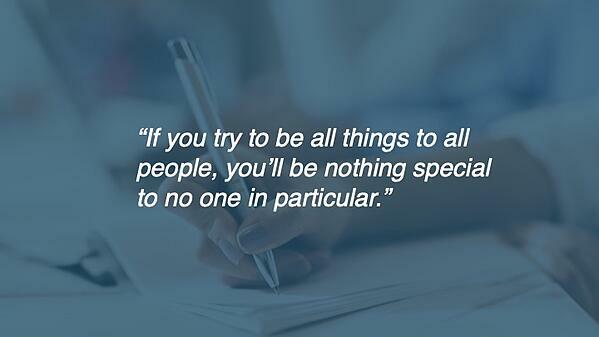 In this new world, what can companies use to set themselves apart? What is B2B Brand Storytelling? B2B brand storytelling is the act of connecting people with your brand through the use of literary elements and allows you to tell a unified story across multiple channels. When executed digitally, you create a trail of breadcrumbs that engages your audience at a particular moment and channel, which traces back to you (or your website). Why Focus on Storytelling Now? Storytelling as a concept is nothing new. Since the beginning of time, humans have been using stories as a means to share and pass down information in a format that is both memorable and relatable. According to research conducted by the London School of Business, which studied the ability of people to retain and recall a set of statics, it was noted that 65 to 75 percent of the stats were retained when they were paired with a story. This is because humans instinctively relate our experiences to the story being told, which then triggers a set of emotions that allows us to remember and recall the information better. A story is more powerful than data alone. As B2B buyers continue to demand more personalized content and experiences, weaving brand storytelling into your content strategy allows you to deliver on these demands more effectively than disparate messages. By leveraging storytelling, you deliver consistent, seamless experiences that are more memorable with potential buyers. So, how do you build a unified B2B brand story that allows you to tell a unified story across multiple platforms? There are five steps for a well-executed story and it starts with introspection. All of this information will come together to create the fabric of your story. For example, our company is a boutique digital marketing agency specializing in the B2B space. When deliberating on what direction we wanted to go with our organization, we decided on B2B because that’s where our background and experiences were forged. 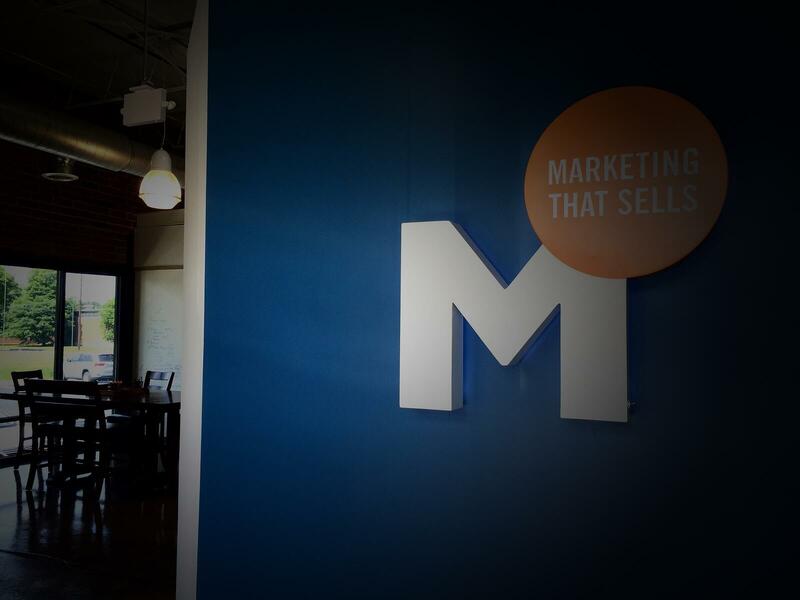 Sure, we could’ve gone after B2C, but our specialty laid in helping B2B companies grow. Too often we make the mistake of thinking that our buyer personas are like us, but that couldn’t be further from the truth. Storytelling works because it's about the customer and creating experiences that resonate with their place in the world. If you are wondering why your marketing programs are failing, one way to approach the subject is to look at what you're doing and asking yourself if the content your producing is product-centric or customer-centric. Remember, people are looking for you to solve a problem. Speaking about your product and your company removes the customer from the conversation and makes them feel like a means to an end. More and more, buyers are looking for brands that are authentic and relatable. Part of getting an understanding of who your audience is by building your buyer personas. These don’t have to be long, drawn-out documents that detail what they ate for breakfast or how many dogs they have. 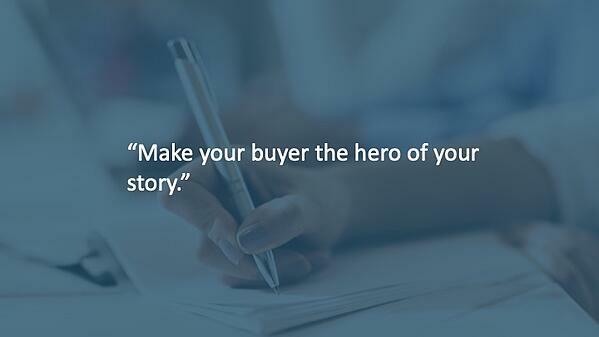 In fact, use this buyer persona template to get started if you don’t already have them. By doing this exercise, you'll be able to match their pain points to your product or solution, which in turn informs the kind of the content and marketing activities you will do to target these individuals. After you have a grasp of who you are talking too, the next step is to figure out where they live in the digital world. Where do they go to get their information? The last thing you want to do is to take a shotgun approach with your marketing program to later be disappointed with poor metrics or worse – wasted ad spend. Having a good understanding of where they go to get information and the process they go through when making a purchase decision is instrumental in creating a highly targeted marketing program that delivers results. For instance, you wouldn't to invest in Facebook if your buyers rarely use the platform. Additionally, say your buyers are all active on LinkedIn but turn towards industry publications when they have a problem to solve. Leveraging LinkedIn for first touches won't have strong results. Don’t make the mistake of ramping up and investing in a channel just because other B2B companies use it. Each solution set has a unique set of buyers that make up the buying group. Steps one through three were prep work. Now we can focus on creating your brand story. A great place to start it to treat your brand story as your value proposition. Your one-sentence summary should be no longer than 18-20 words and be driven by your company’s values, purpose, and mission. Remember that the purpose of this exercise is to build a unified story that demonstrates the value you provide to your buyers. Below is the one sentence formula for nailing your brand story/value proposition. Your value proposition is important because it serves as the foundation from which you will build all your stories and makes it easier for you to provide consistent messaging across channels and platforms. Below is an example of what these one sentence brand story/value propositions looks like. 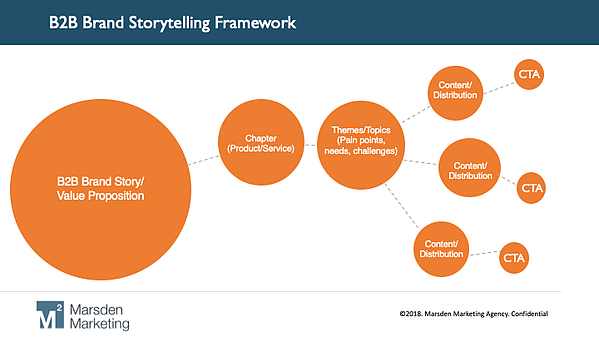 With steps one through four now complete, you can now build your B2B brand storytelling framework. This is also a great way to incorporate storytelling into your content marketing strategy. Once you’ve have completed your value prop, you can move into breaking it down into chapters (second set of information) that reinforce your main storyline. One example of chapters would be one for each service and product you provide. After establishing chapters, go ahead and break those themes further into individual topics (third set of information). 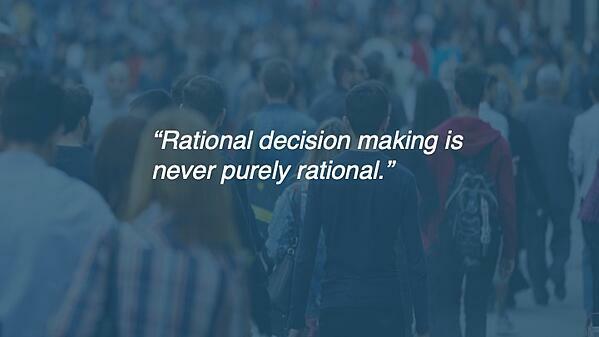 This is where your buyer personas come in handy. Topics should be those questions or pain points that your buyers experience. Finally, move on to producing content (fourth set of information). Based on the buyer targeted in each topic, choose a channel that is meaningful and a format that is desirable. Some buyers prefer written content, some prefer video, and others prefer interactive content. 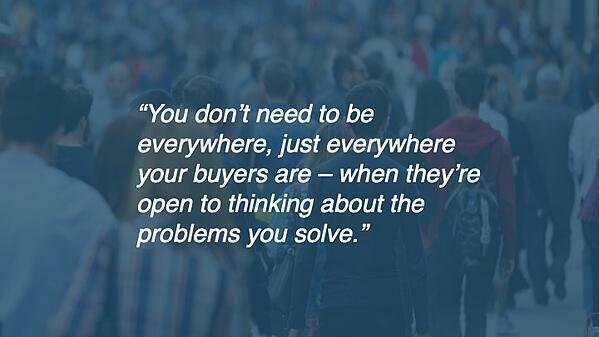 Again, lean on your buyer personas to inform you of what makes the most sense. At this point, you can start to see how using your brand story can be used to create digital breadcrumbs that lead your audience back to your website. Below is an example of how we use this system at Marsden Marketing. Today’s buyers are in control. They expect brands to provide personalized content that helps them solve their needs and challenges. As you work on weaving the threads of your story into a solid content marketing strategy, keep in mind your trying to build a relationship with your audience. After all, B2B is all about relationship selling and storytelling is a surefire way to capture the hearts and minds of your prospects. Ready to take your content strategy to the next level? Download our B2B Brand Storytelling Worksheet to get started.